Average Weight	: 33 - 40 lbs. The Kerry Blue Terrier originated in the 1700s in the County of Kerry in Ireland, from which the name "Kerry" derived, along with "Blue," for the color of their coat. The Kerry Blue is heralded as the National Terrier of Ireland, where it is known as the Irish Blue Terrier. The Portuguese Water Dog is part of it’s ancestory ~ contributing to the Kerry's single, silky, wavy coat. It is also believed that the Kerry Blue Terrier was developed from the old black terriers, Spanish (or Russian) "Blue Dog," Soft Coated Wheaten Terrier and possibly Irish Wolfhounds, Irish Terriers and a Harlequin Terrier of more than a century ago. The Kerry Blue has a history of being very versatile with it’s talents to hunt small game as well as retrieving, herding sheep and cattle, guarding the home hearths, police work and as a family companion. The history of this native of the Emerald Isles is not well documented. There’s a long stretch of time between 1588 when some elegant “puddle dogs” swam ashore after the wreck of ships of the Spanish Armada off the Irish coast and 1808 when the Irish Blue Terrier is first mentioned in writings. Nevertheless, it was noted that a breed of silver-blue dogs had been breeding true in County Kerry for more than 150 years. A second theory claims that Spanish dogs interbred with local terriers to create the Kerry Blue. They were the crofters’ all-purpose dogs and were used for fighting, ratting, controlling farm pests, herding, hunting, guarding and even operating the butter churn. •	Not a breed for everyone as this is a Strong willed breed. •	These dogs are intelligent even known to be taught to perform tricks. •	They have a very good memory. With meek owners they will become willful. •	Needs a lot of patience and firmness, plus a good sense of humor, when training this breed. •	Kerry Blues are an active breed…..they need plenty of exercise daily. •	Low shedder, considered a hypo-allergenic breed. •	Feisty, not great with other dogs. Can be aggressive & doesn’t back down. won't pick a fight, but he might try to end it if he's taunted. •	Keeping your Kerry Blue groomed is expensive and, if you do it yourself, it's hard work. •	Kerrys are known to love digging, chasing and chewing. •	Animated, playful and comical. •	Alert, determined and rowdy, it enjoys roughhousing. •	A good watchdog, but will not attack unless it is really provoked. •	If Kerry owners are not 100% pack leader and lack canine communication skills the Kerry can become aggressive. •	They rarely bark unnecessarily. •	Kerry Blues require a confident owner who has a natural air of authority, and need firm obedience training. The Kerry Blue Terrier is strong-headed and can commonly found in high spirits. Loyal, affectionate, and gentle, these dogs can be considered mean to smaller dogs but have very kind hearts. Because of their size and stature, many have been used as competitive dogs and have even been nicknamed "Blue Devils" for their toughness and competitive streak. Modern breeders commonly take advantage of this breed's natural aggressive qualities, and the dog can be very vocal and especially aggressive as a puppy. It is important to maintain a firm but kind tone with these dogs as they can become especially sensitive to feedback and attention. The Kerry Blue Terrier is especially well-suited for work, both indoors and outdoors. They are incredibly intelligent and work well with tracking, hunting, and of course sheep herding. Naturally obedient and very agile, these dogs will pick up new skills very easily and enjoy learning tricks. They fare well with new activities and will rarely turn down an opportunity to be active. 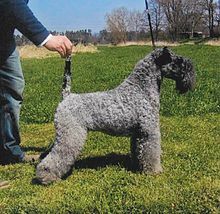 The activity of the Kerry Blue Terrier is especially high, and they require an active lifestyle to stay healthy. These dogs require daily, intensive exercise and will do well with agility training in a variety of settings. It is important to keep them well-groomed and they may have difficulties with bathing rituals and routines. Training them at an early age will prevent these dogs from thinking they are the master; still, the Kerry makes a wonderful companion and enjoys attention from family members and owners. They are happy to be around people, and can be socialized easily at a very early age. It is important to make sure these dogs are socialized with other dogs as well, since they can come across as intimidating on many occasions. These dogs learn as they play, and this is an important part of training and development at any age. They can be especially responsive to feedback and making sure a consistency during training takes place is a top priority. The Kerry Blue Terrier is protective, and can be quite the handful if it is part of a large family of pets. Firm obedience training is the best way to handle these dogs, and they have a large range of memory skills and athletic ability. These dogs enjoy a challenge, but can also become very stubborn. If they become bored or restless, they will easily move away from their routines. Combining intensive exercise and relaxing activities with training is a great way for these dogs to become competitive, strong, and mindful. These dogs make wonderful companions after receiving affection from their owners, and are naturally loyal and obedient as a result. The Kerry Blue Terrier needs to be groomed on a regular basis. Ideally, grooming should take place once every six weeks, as this will help keep hair clean, free of dirt, and glossy. Since the coat has a tendency to become bristly or rough, bathing and conditioning the coat is required at least once per month. The hair of the Kerry Blue Terrier needs to be maintained short and flexible; the hair needs to be pulled out of the ear canal as well, since it can grow to the point where infecions and dirt build up too easily. When hair becomes too long, wax and dirt can be especially disadvantageous to the dog. Grooming the dog can take some time and training, and patience is key! A professional groomer will make use of the appropriate brushes and combs to make the session successful, and it is a good idea to learn how to do this with an expert's advice or direction. Dogs that require extensive grooming will need professional services on a regular basis. The distinctive blue coat is especially attractive for competitison and shows, and it is relatively easy to maintain. The Kerry Blue Terrier sheds very little and the dog is odorless, even when wet. Frequent bathing is recommended, and will not dry out the skin as it would in other breeds. These dogs do not tend to get allergies easily, and they maintain their rich coat throughout the seasons. The Kerry Blue Terrier is a naturally athletic dog, and requires plenty of long walks. The best exercise for these dogs involves a combination of running, walking, and jogging. Jogging alongside the owner is a wonderful way to bond with the dog, and provides plenty of fresh air. These dogs require stimulation on a regular basis, so dog toys and other activities indoors will help them stay positive and intelligent. These dogs do not tend to be destructive in the house, and thus are well suited for smaller living spaces. An ideal workout for the Kerry Blue Terrier is running outside in a large, open space. However, these dogs may run off too easily and will need to be restrained, well trained, or simply be held back on a leash. Tug of war games, Frisbee, and fetch are the best outdoor games for these dogs. Since they are natural sheepherders, providing them with enough grounds to run upon is essential to their growth. These dogs may seem as if they have an endless amount of energy, and elderly owners may have difficulty keeping up! Regular exercise is a natural part of their lifestyle and needs to be incorporated into their routine as often as possible. The Kerry Blue Terrier is easy to train and socializes well with new owners, companions, an dmasters. They are best trained at an early age and can be taught key obedience skils in a matter of a few weeks. The Kerry Blue Terrier is a natural problem solver and can become very independent quickly. They enjoy challenges, and will pick up new skills and behaviors after only a few trials. They may have difficulty with inconsistency and constantly-changing surroundings; still, these dogs will adapt well and enjoy positive encouragement and attention from their owners. The first step in training the Kerry Blue Terrier is to make sure obedience is fun; they need to be excited about following the rules, and they will respond well to training that is intermixed with play. They can become quite attached to a favorite toy, ball, or other physical object and will shape and learn behaviors when they can be playful and relaxed. Since these dogs learn so quickly, speed and repetition are only important in the beginning. These dogs will pick up new skills relatively easily and may become bored; it is important that they are offered a wide range of activities to explore, grow, and adapt to. The Kerry Blue Terrier responds immediately to body language and tone, and it is essential that they are praised outwardly and given plenty of physical affection. These dogs are quick, alert, and attentive; they are naturally agile and will rarely miss an opportunity to prove that they have successfully completed a task or project. Making sure the dog is corrected when it has misbehaved is an important part of training, and they will respond positively with consistency and firmness. A simple 5-10 minute session once or twice per day is the ideal amount of training for these dogs. Mixing play with each training session will ensure that these dogs are given ample amount of variety in their learning process.